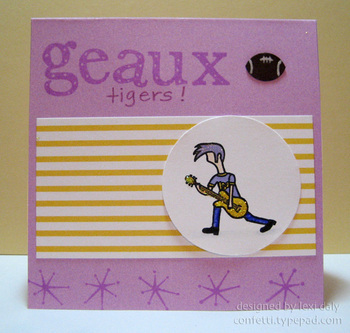 confetti by lexi: rock star loves football! after the saints card, i had to get the rock star ready for a little college ball too. 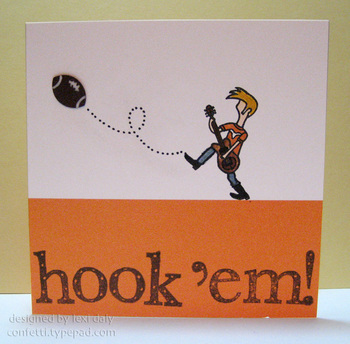 first up, my alma mater, the university of texas--go horns go! (insert shaking cowbells) with a little doodling, he's sporting the standard longhorn t-shirt and boots! i love how tilting the rock star creates a variety of rockin' poses--this one was perfect for kick off! credits: all stamps, a muse; palette noir and burnt umber ink pads; su! orchid opulence pad; misc. copic and su! markers; pigment liner pen (shirt doodling); sakura glitter and white glaze pens; stickles; marvy circle punch and su! slit punch. about the football: i tried the slit punch on a whim for the saint's card because it was still sitting on my desk from another card and was thrilled that it worked so well. punch it once on a small scrap, then flip it around and punch again. add white details and voila! don't ya love it when that happens!